For what is now a decade Ferry Corsten has been providing dance music fans with a regular dose of the hottest, most in-demand music through his widely popular Corsten’s Countdown radio show. 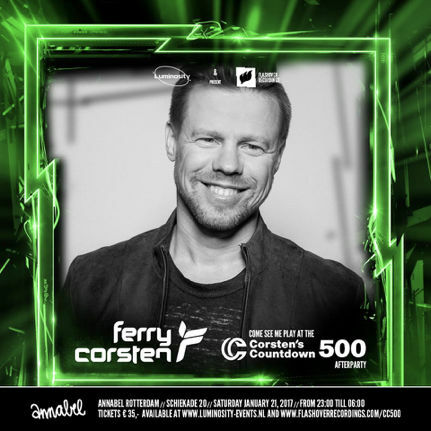 Now, following the arrival of the show’s 500th episode, Ferry Corsten is to celebrate this milestone in spectacular fashion with a Corsten’s Countdown 500 special 8-hour live broadcast from his hometown of Rotterdam. Coming live from Club Annabel in Rotterdam on Saturday, January 21st and in partnership with Luminosity and his Flashover Recordings imprint, Ferry will host an 8-hour live broadcast that starts at 16:00 CET. He will be playing tracks requested by fans from all over the world. Listeners are invited to mark their favorites on this website. Near the end they will be asked to submit their Top 3s. All combined this generates the ultimate Top 10, that will be played by Ferry Corsten in the final hour of the broadcast. Beamed live via a selection of the shows worldwide FM partners that include countries such as Argentina, Australia, Germany, Mexico, Russia, Spain and UK, as well as being available to stream worldwide via DI.FM, the Corsten’s Countdown website and YouTube, host Ferry Corsten and a selection of staring guests will all ensure the occasion to one to remember. During the live broadcast fans can also expect to hear exclusive interviews on the CC500 airwaves from the likes of Armin van Buuren, Markus Schulz, Cosmic Gate and many more! After the broadcast concludes, Ferry Corsten will be joined for the afterparty by a stellar selection of named spinners that include Giuseppe Ottaviani (Live 2.0), Robert Nickson, Solarstone and Stoneface & Terminal, as well as Ferry Corsten himself and a very exclusive Gouryella special set. Click here to buy tickets for the afterparty. Check when the broadcast starts in your local time zone here.